“Asian” is British media code for “Muslim.” Non-Muslim Asians have complained about this usage to no avail. In any case, is Britain diverse enough yet? There will be much, much, much more of this. The implication there is that if women do not cover themselves adequately with their outer garments, they may be abused, and that such abuse would be justified. 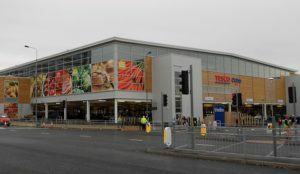 A woman was raped on a bench in an “horrific attack” after being led away by a man from outside a Tesco supermarket. Police have launched an investigation after the victim, aged in her 40s, was sexually assaulted in Stretford, Greater Manchester, at around 6.30am today. The woman was stood outside the supermarket in Chester Road when she was approached by a man. He then led her to a nearby bench and raped her, police say. The man is described as 5ft 6ins tall, Asian, of medium build with a short beard and black hair. He was wearing a black overcoat with dark jeans and a brown belt…. Anyone with information should contact police on 101 quoting incident number 646 of 04/02/2018, or the independent charity Crimestoppers, anonymously, on 0800 555 111.